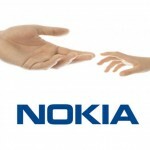 Nokia Belle refresh is the new update for first generation Symbian devices. 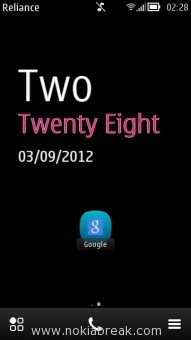 It comes with lots of new features like new browser, widgets and lots more (read Nokia belle features). Here, we are going to introduce Web Link Application which is the new feature comes with the Nokia Belle Refresh. 1. Quick Open Favorite Website: Now, users can create shortcut of their favorite website as application. Simply Tap on the Application shortcut to open the website without typing or opening the bookmarks from the Nokia browser. 2. Homescreen Shortcut: Users can also show the web application shortcut on the Homescreen, which will help users to visit the website without opening the menu or browser. 3. Easy Uninstall: If you want to remove the Web Link App, simply tap on the Application and Select Delete. The web application will be deleted automatically. 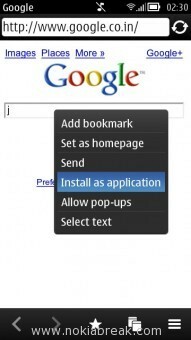 Web Link Application is quite different from the regular bookmarking feature which comes with the Nokia Browser. It allows you to visit the website without opening the browser and bookmarks. Normally, you can save your favorite website names as Bookmark in the Nokia Browser, but with Nokia Web Link Application you dont have to bookmark the websites. Simply visit your favorite website and Tap on the screen for few seconds and Select Install as Application. The Website Application will be created automatically which helps you to open the website from your homescreen or Menu. Note: This feature is only available with the new Nokia Belle Refresh update only. If you are still using Nokia Belle then this feature will not appear on your phone (in this case you have to update your phone to belle Refresh). 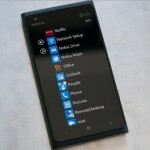 If you are new to Nokia Belle refresh the dont forgot to read the list of new features comes with this update. don’t have time to read it all at the moment but I have book-marked it and also included your RSS feeds, so when I have time I will be back to read much more, Please do keep up the great work.